In the late 80s I worked as a contract software engineer and lived as a sort of a self-propelled technological vagrant. I had never had an interest in cars and wouldn't learn to drive for several more years so all my travel was by public transport, by bicycle or by foot. Many people thought this an unusual choice, but I managed to make my way with an ancient laptop computer and portable stereo to wherever I had work to do. For a few months I worked off and on at a location in South London where I found accommodation in a local family's spare room. It was just as well that I didn't drive as there would have been nowhere to park a car, Mum, Dad and both their sons had cars so the driveway and the road outside were already full. They were sociable people and there were often conversations over breakfast, often concerning annoyance with traffic jams and the cost of fuel. One morning my landlady told me that it was going to be expensive for her but because she was so concerned about the environment she was buying a new "green" car (she used the word "green", which then just as now I found an odd choice to describe any car). product which kills over a million people every year is "safe". It seemed to me that the problem with that area was that is was dominated by cars. I couldn't see how changing from one model of car to another was going to achieve any sort of transformation (I think I've been proven to be right as it's still dominated by cars, just like the rest of London). 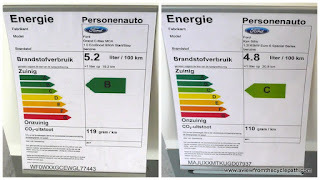 I pointed out that building a new car costs in lot of energy and resources and that therefore keeping an older model going for a few more years would quite possibly have a lower environmental impact than changing prematurely to a new one. I also pointed out that the new car would burn fossil fuels at much the same rate as her old car so those gains would be marginal at best. But it was too late for any of this as the marketing people's work had been done and a mind had been made up: My temporary landlady was convinced that new technology made the new car so much better than the old so she was buying one. What was this new technology ? It was merely that the new vehicle could (optionally) run on unleaded petrol. The environmental advice on offer to drivers is confusing. to not buy or use a car. I was a guest in someone else's home and I left it at that, but this thought always stayed with me: Marketing works. A very pleasant woman had been convinced to part with a lot of money to buy a new "green" car because she thought it would allow driving with a clean conscience, in addition to it being a nice thing to show off to her friends. Of course she was far from the only one convinced: Many millions of people have since followed the same path. Now it's a good thing that lead was removed from automotive fuels. The entire planet was being contaminated with lead from the exhausts of cars and this was especially concentrated in cities and alongside busy roads where many people lived. The result of lead pollution included lowered intelligence and higher crime rates. But could a car modified only so that it could run on lead free fuel be said to be "green" ? Surely not. Hardening valve seats to allow use of unleaded fuel was a relatively inexpensive development which allowed for a new model year of car to be produced, distinct from the old, but it was really just the smallest improvement which the manufacturers could make when faced with possible legislation against them. The greater problems with cars had not been tackled - new cars burnt just as much fuel as the old and carbon emissions were therefore the same. The "green" marketing served its purpose in that it extracted money from customers' bank accounts and sold more cars, but it did nothing for the environment. driving. Tyre rubber makes up a large % of the "plastic soup"
Since that time there have been several other claimed environmental improvements to cars, including catalytic converters (introduced later than lead-free in the UK), autogas, "clean diesel", hybrid, plug-on hybrid and fully electric cars. In each case, bold environmental claims have been made by car manufacturers. Each new type of car was marketed as offering the dream of continuing our lives as usual or even of increasing our use of cars while allowing drivers to have a clean conscience. It's public knowledge now that the clean diesel claims were deliberately based on a deception, but actually this has all been an illusion. Electric cars are the current hype so that's something that's worth talking about now. A 1950s mini and a modern mini have similar CO2 emissions. 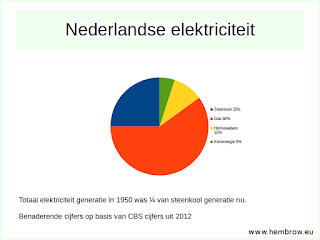 In the Netherlands, 25% of electricity is generated by burning coal and 60% by burning gas. i.e. in total the electricity is generated 85% from the burning of fossil fuels. That is why the CO2 output as a result of driving an electric car is almost identical to that from driving a fossil fuel powered car. I'm doubtful that any real progress has been made in reducing total CO2 emissions from cars since I had that conversation nearly 30 years ago because while cars haven't become significantly more efficient, their use has most certainly increased since then. 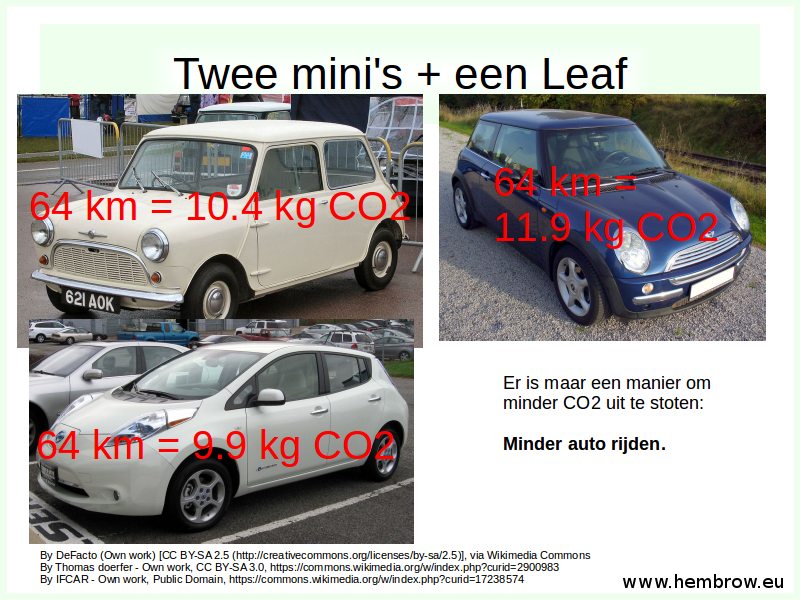 Extend the time-line a little and we can be absolutely sure that modern cars produce more CO2 emissions than were contained in the obviously dirty exhausts of the 1950s because today's "green" cars are far higher in number and this swamps the relatively small efficiency improvements made. growth continues, reaching an all-time high in 2016.
while that's good news, it's a topic for another day. I think at this point it's worth bearing in mind that by the late 1980s in western nations, car usage had already been through its steepest growth period. In countries where the strongest growth is happening now or where it is yet to come, all the growth is just growth and all the emissions are in addition to what was there before. There is no possible argument that these new emissions can possibly be countered by improvements in efficiency over what there was before. More cars are leading to more pollution. It doesn't much matter what the fuel source is, the result is the same. The only way to produce less pollution from motor vehicles is to use them less. Update 2018: A study from the University of Edinburgh / INNAS has suggested that particulate emissions are in fact no lower from electric cars than from internal combustion engine cars. To summarize: 90% of PM10 and 85% of PM2.5 emissions do not come from the exhaust pipes of cars but from tyre and brake wear. The heavier weight of electric vehicles results in their emissions from these sources being higher, cancelling out the relatively unimportant issue of not having an exhaust pipe. 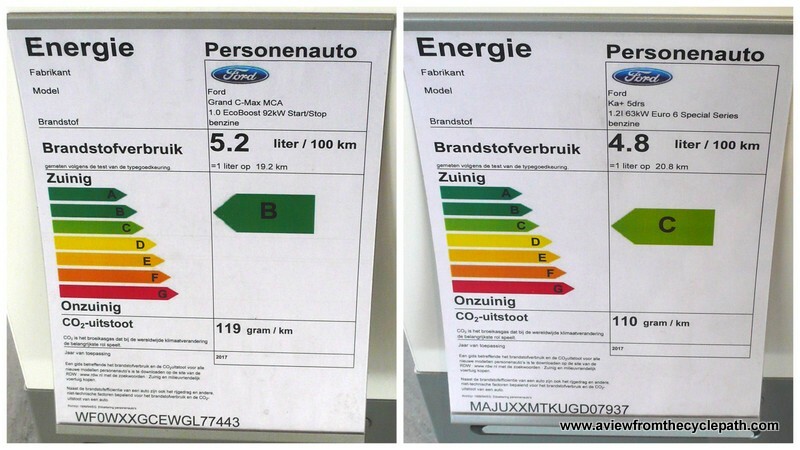 The report suggests that lighter vehicle weights should be pursued in order to improve emissions. encourage people to buy relatively inefficient vehicles. Anyway, most car journeys are over cycle-able distances. Governments around the world are now falling over themselves to offer incentives to those who buy new electric cars. Many millions of $, €, ¥ and 圆 are now being given away to encourage people to drive. For example, the Dutch government has offered €1000 to people who scrap their old cars, but only if they use the money to buy a new car. This is a subsidy which encourages people to continue to drive. Anyone who wishes to scrap their old car and not drive at all cannot receive the subsidy. In addition, there are other incentives worth thousands more for people who buy an electric car. All these subsidies and incentives can only be used by those who choose to continue to pollute by continuing to drive. What's more, the more you drive, the bigger the saving that can be made. Most journeys made by motor vehicle are short enough that they could instead be made by human power. In most cases a normal bicycle or by using an efficient bicycle such as a velomobile to cover slightly longer distances and enable comfortable cycling in all weathers. There are no subsidies to help to enable people to buy velomobiles. Modern, efficient, velomobiles are almost all produced by Dutch companies, but these companies do not receive the support from government which is offered to foreign companies producing electric cars. The Netherlands continues to achieve more for cycling than any other country but even here there isn't enough attention being placed on encouraging people not to use motorized transport. 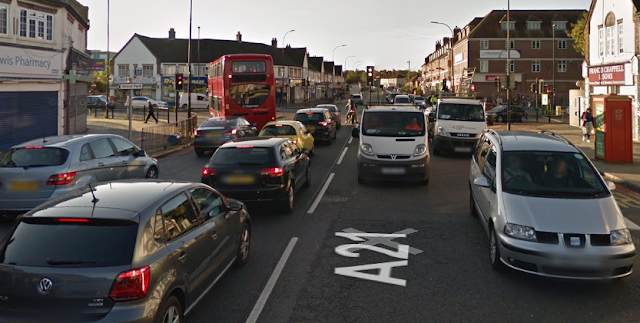 Roads for cars receive at least ten times the funding available for cycling facilities. twice as much coal is burnt now compared with before. But can't we use "green" electricity ? 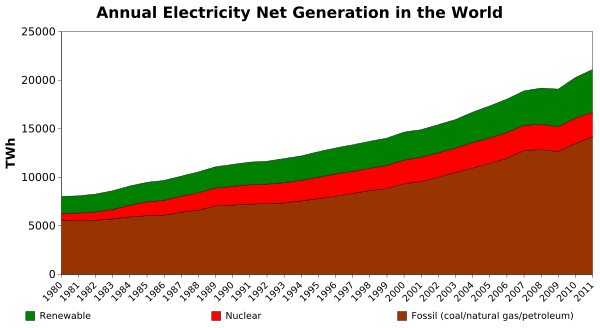 50 years ago, almost all electricity generated around the world was the result of burning coal. This was the case in the Netherlands as well. 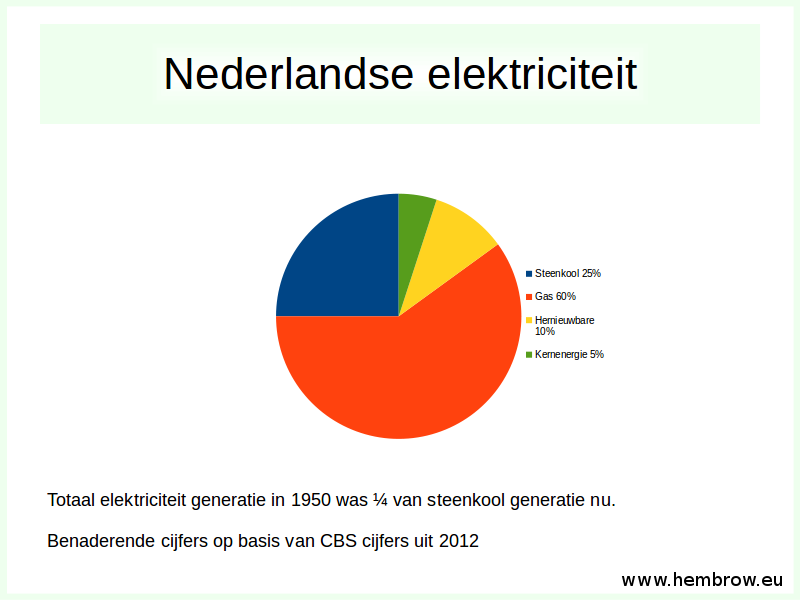 Now just a quarter of all electricity in the Netherlands comes from coal, which might look like progress. Unfortunately, the consumption of electricity has grown so much that to generate a quarter of our electricity today requires burning twice as much coal as was burnt 50 years ago. In addition, 60% of electricity results on burning gas, which produces about half the CO2 emissions of coal for the same useful electricity output but because more than twice as much generation comes from burning gas as from coal, the emissions of the gas power stations are even greater than the emissions of the coal stations. wide. The brown part is the contribution of fossil fuels. to run solely on renewables when faced with this data. The contribution from renewable sources is still small at around 10% of the total, and it's still intermittent. We have an array of solar panels on our roof which generates more electricity than we use in our home and our business combined each year. Unfortunately, on overcast rainy September mornings like this morning, our "3600 W" system only produces about 1/10th of the electricity required to boil a kettle for a cup of tea. While we generate more electricity each year than we use, we don't only consume the electricity that we generate. Output in winter is far less than our use during that period and of course we could never run our lights at night time from our solar power. The balance of the energy used comes from other sources, which in the Netherlands mostly means gas, coal and nuclear despite our having signed up to a "green" tariff. If everyone were to switch to driving an electric car then double the amount of electricity would be required. Not only would this require very many more generators but it would also create an expectation that vast amounts electricity ought to be available immediately to every motorist who arrives home at the end of a working day because they expect to be able to drive their car again later that evening or next morning. Unfortunately, the huge current consumption of fast charging (30 A for each Nisssan Leaf fast charger) of millions of electric cars plugged in at the end of the working day is simply not compatible with the way in which electricity is generated, at a consistent level all day through for traditional generators and when the sun shines or wind blows for renewables, and there are absolutely no viable storage technologies which could smooth this out (no, not with a battery and not with pumped storage either). The only solution is to use less electricity, especially overnight and during winter when there is less solar power and also at any time when the wind isn't blowing hard, when what we should be looking to do is to reduce electricity usage. That means not expecting to be able to charge vast numbers of electric cars. What about trains or buses ? 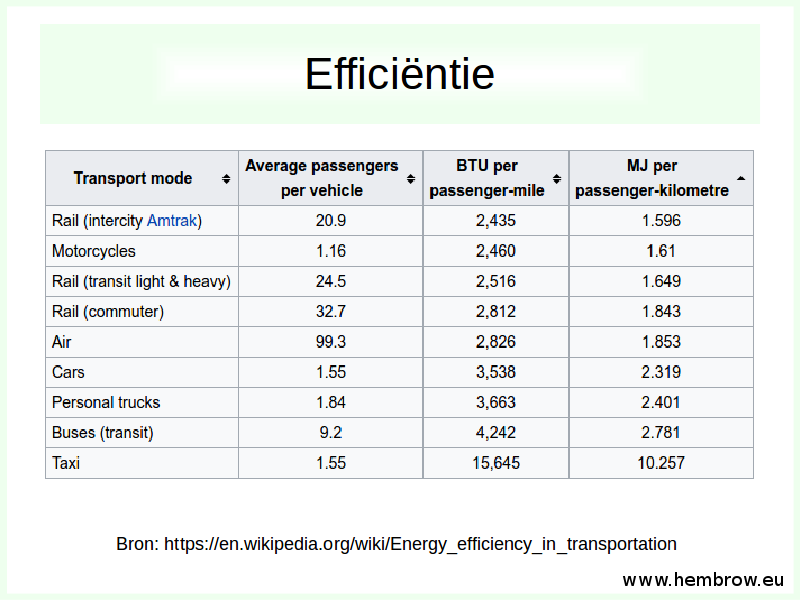 Unfortunately, public transport such as trains and buses use a very similar amount of energy per passenger kilometre to a car. There's no substantial gain from switching from one mode to another. To reduce energy consumption and the resulting emissions caused by transport we have to fewer journeys by motorized means over shorter distances. The Dutch railway company NS boasts of using entirely wind energy to power their trains, but this is an illusion. All that's happening is that they have signed up for a wind energy tariff. Anyone can do that. I'm sure many of my readers have already done so. We did this many years ago and when I looked into it I found out where my "green" electricity really came from. Having a green tariff doesn't mean that your electricity genuinely comes from that source because there would then be no guarantee of supply. Dutch trains don't grind to a halt when the wind stops blowing, they simply continue to run on the same mix of electricity sources as every other electrical device in the Netherlands. i.e. 25% coal and 60% gas. 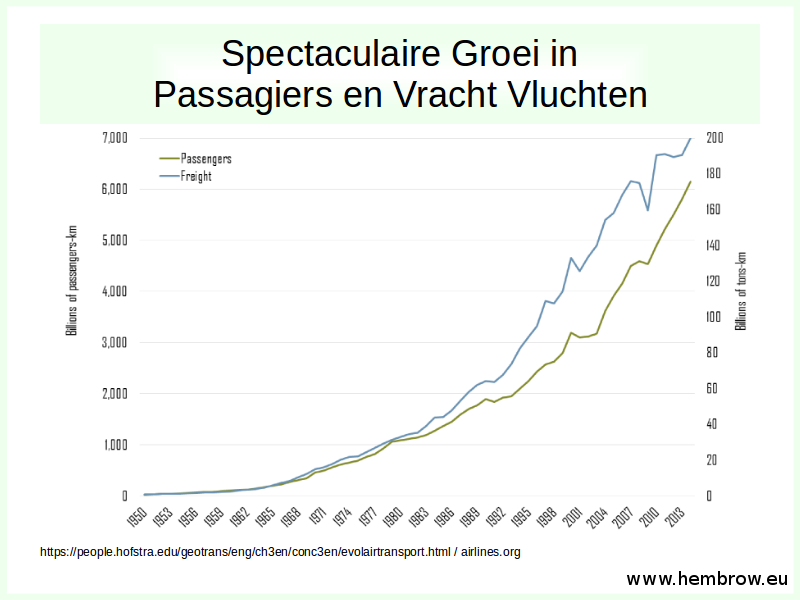 Not only do we now use cars about 10 times more than we used to in the 1950s, but we fly about 30 times as much as we did at that time. Despite great increases in the efficiency of aircraft this has resulted in enormous growth in emissions. Not only passenger transport, but the shipment of goods has also also grown enormously. The Berlin Airlift required an unprecedented effort by the Western Allies using military and civilian aircraft to move enough food, fuel and other supplies into Berlin to sustain the population over 15 months in 1948 - 1949 however routine civilian cargo flights now move the same weight of goods by air every four days. The original Boeing 707 was sold in the 1950s on the basis that it consumed a tenth of the fuel per passenger km, and therefore would create about 1/10th of the CO2 emissions, compared with a contemporary ocean liner. Since that time, jet aircraft which were then a new technology have become three times more efficient while the efficiency of ships, which were already a developed technology, has not moved markedly. Anyone who travels by ship instead of by aircraft on the grounds that it's "green" has made a huge error. The only way of reducing the emissions of your journeys is to travel less. Ships powered by sails alone have genuinely low emissions but while there have been frequent stories over the past few decades (even so long ago as the 1920s) about new ships with sails, wings and kites, only a handful of ships have ever used these techniques to reduce their reliance on fossil fuels and there are (very nearly) no sailing ships in current use for cargo or passenger travel. Carbon offsetting doesn't work. Removing coal, gas or oil from the ground and burning it is a one-way process. Paying someone in a far off country to plant a tree does not remove CO2 from the air and put it back underground, it merely moves some amount to temporary storage in a tree. If you live in a western developed nation it's quite likely that where you live now is a place which was once a forest, or at least covered in more vegetation than you see around you. Please do plant trees as that compensates to some extent for deforestation which has already happened and continues to happen, but recognize that doing so is only replacing the trees which have already been displaced. It does not compensate for using fossil fuels. Similarly, you can't compensate for higher usage of fossil fuels by eating a vegan diet or by not having children. Yes, it's true that both of those things will reduce your carbon footprint relative to someone who eats meat or has children, but they cannot make it it negative as would be required to compensate for burning fossil fuels. Airlines, movie companies and other businesses have partnerships with carbon offsetting companies because it's good marketing, greenwashing a company reputation rather than actually solving a problem. We can't buy away our effect on the planet, we can only reduce our effect by consuming less. The Three Rs of environmentalism are supposed to be "Reduce, Re-use and Re-cycle". They're always stated in that order because "Reduce" is most important but unfortunately it's also always been the least popular suggestion of the three. Buying ever more stuff and sending it away at the end of its (short) life so that someone else hopefully will be able to recycle that stuff is not the same as buying less stuff in the first place. Where transport emissions are concerned it's really only "Reduce" which has any relevance. 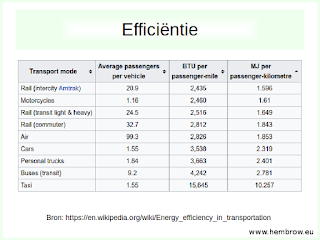 The only way we can reduce our emissions through travel is to reduce the number of kilometres per year that we travel by using motorized modes of transport. 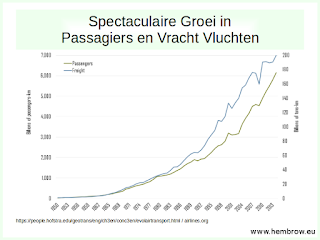 Unfortunately, the pattern of the last few decades has been one of extraordinary growth with people using cars more and flying much more so that they can take holidays at greater distances from home. Who is a "cyclist" ? As "cyclists", are we helping or hindering ? What proportion of the distance that each of us covers each year is by bicycle ? The average Dutch person walks or cycles about 10% of their journeys by distance. Similarly, I suspect that many enthusiastic people who read this blog and identify as "cyclists" actually cover rather more distance by a mixture of car, aeroplane, bus and train than they do by bicycle. If we do that, and our cycling is actually a minority mode for us, then perhaps we should identify instead as "motorists" as the majority of our transport is actually by motorised vehicle. I'm not getting at you, dear reader, I'm asking you to think about it. Think about your own travel patterns and those of others. I'm thinking about it. 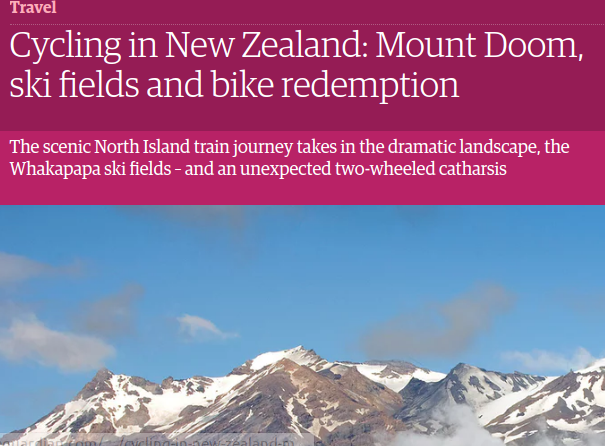 I refused an invitation to attend a cycling conference in Australia a few years ago because of the travel and more recently refused to open a cycling event in Norway for the same reason. However at the same time we've been encouraging other people to make long journeys by offering study tours. I feel that we should stop offering the tours, but people will still make those same long journeys by motorised means to visit the Netherlands or other places in order to cycle short distances. continue to ignore the problem that we're creating ? While it's impossible to say that the storms which are currently affecting millions of peoples' lives are directly the result of man-made climate change, it's widely accepted that even if they are not so caused, climate change will certainly have made their effects worse. The people affected by these storms are suffering at present and we can all do a little to help. In the Netherlands, the Rode Kruis is organising a help effort. Give what you can, but think also about how your personal behaviour can influence future weather patterns. None of us can continue with "business as usual". So far as transport is concerned, and transport is the subject of this blog, we need to reduce how much we use all motorised modes. 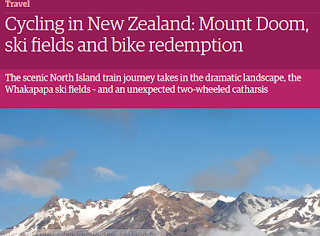 Cycling can't "offset" motoring. It can't "offset" the burning of fossil fuels and there are no motorized modes which don't use fossil fuels. Are we, every one of us, individually, part of the solution or part of the problem ? This blog post is based in large part on a presentation which I made in Assen in January. If you wish, you can read the original slides and a version of some of the text of that presentation.